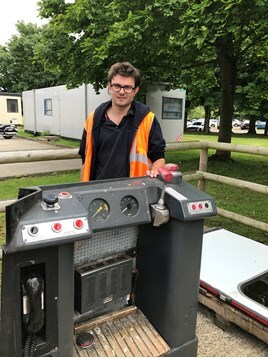 Paul Haines, the winner of RAIL’s cab desk competition (RAIL 825), collected his prize from Vivarail at Long Marston on June 13. The desk had been stripped from a former London Underground D78 train, which has been gutted and completely rebuilt as a Class 230 D-Train. The CrossCountry driver visited the site with his wife Andrea to collect his winnings. He was shown Vivarail’s battery train, on which he also had a ride, and inspected the cab of a Class 230. The cab desk is destined for Paul’s children Ella (8) and train-fan William (4), although the exact plan remains a secret. For more on D-Train, read RAIL 829, published on June 21. For more on D-Train developments, read RAIL 830, published on July 5. Initial Williams Review findings show five key issues facing the railway.